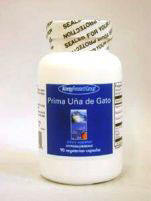 Prima Uña de Gato contains Cat's Claw (Uncaria tomentosa) extract standardized to a minimum of 0.5% pentacyclic oxindole alkaloids (POAs) and free of tetracyclic oxindole alkaloids (TOAs). Proponents of this form of Cat's Claw say that is many times more effective than ordinary Cat's Claw. Use under medical supervision. Herxheimer reaction may occur. Sensitive individuals may need to stay with 1 capsule per day for an extended period of time, and increase very gradually. Not recommended for pregnant or nursing women or organ transplant recipients. As a dietary supplement, 1 capsule 1 to 3 times daily, on an empty stomach, or as directed by a healthcare practitioner. Floradix is rich in iron & vitamins B And C, increases energy and stamina, is easily absorbed and non-constipating.